A king will die and another king will be crowned in tonight’s episode of Ramadan Arabian Podcast. Tonight we got a very interesting episode in our show “One Thousand and one nights” produced by Egypt’s State radio in its heyday. I won’t talk too much because lots of things happened in tonight’s episode which was 270th episode to be accurate in our show’s long record. You can find the new episode after the break. After telling his sons his well, King Hathor passes away and his Djinn kingdom mourns him. For nearly three months, his sons or the three princes mourn their father neglecting their duties as well as their nemesis Haddam. Faithful vizier and father-in-law Shanshour goes to them and tells them that they should act fast but first, they must among themselves who will be the king. Amazingly, the three princes surprise him and tell him that they want the people to choose among them. Thus the wise Shanshour suggests that the High Priest of Djinn should choose the King on the Day of the Sun where the Djinns celebrate at the Grand Temple. 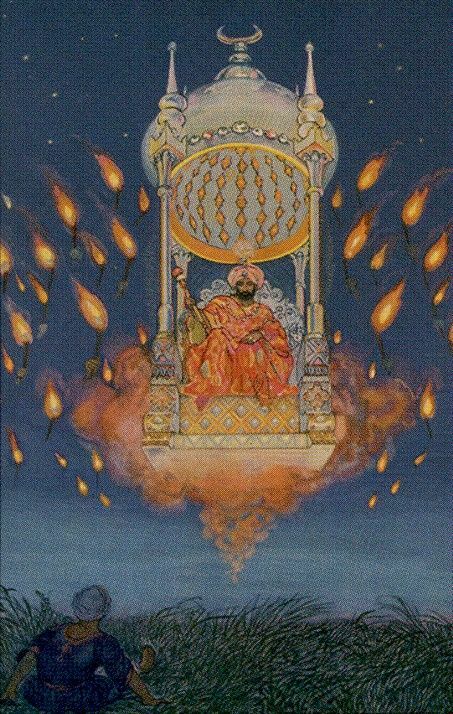 On the Day of the sun, the high priest chooses Prince Saeed from the triplite because he was born first. The Djinn and the princes declared their loyalty to him. King Saeed begin to explore his father and ancestors’ valuable artifacts and finds something he shows to his siblings. Among those valuable magical artifacts: The invisibility hood which make the djinn invisible. Once owned by King Khofu himself, late King Hathor leaves a magical message to his sons about it. That message says that this hood to be used only three times. The first time is for a curious owner to see how it works while the other times will happen at the right time and place. As the new king and his sibling princes think about the meaning of the right time and place, a bad news arrives: Vizier Shanshour passes away. Meanwhile, in the Underground kingdom of Haddam, the evil king plans to destroy the unity of three brothers by turning them against each other. His aide says he can turn them against them through the High priest himself but he needs an extra , he needs “Rouh El-Khiana” or “the spirit of treason” that turned to an evil female ifrit. Haddam’s Ifrit aide shapeshift himself in to a merchant and goes to the Djinn kingdom to start his dirty mission.